As the PC desktop and laptop market slumps and the tablets market grows, it might seem obvious to tablet users why that's so. However, details shared by analysts dramatically highlight three reasons behind robust tablet growth. Tablets are growing so much in popularity that they will outstrip laptops shipped in 2013, IDC said, while tablets will exceed both laptops and desktops by 2015. There are three key reasons for the tablet's success. First, tablets, on average, cost less than laptops or desktops -- about 60% as much. Second, tablets are lighter and smaller, on average, and, therefore, more mobile, than laptops. Tablets with screen sizes that are less than 8 inches will make up 55% of the market in 2013, IDC said this week. Third, tablets function differently from laptops and desktops and are regarded as easier to use. They have instant-on capabilities, longer battery life and touchscreens that users, so far, don't seem to want on desktops or laptops. Overall, IDC said tablet shipments will grow by 58.7% in 2013, reaching 229.3 million tablets, an increase from 144.5 million last year. Meanwhile, PC shipments in 2013 will fall by 7.8%, the second consecutive year of negative growth, IDC said, as users delay PC purchases and turn to tablets and smartphones for more of their computing needs. The bring-your-own-device (BYOD) trend in workplaces is adding to the PC decline. In its forecast, IDC said there will be 187.4 million laptops shipped in 2013. Desktop PCs will account for 134.4 million shipments in 2013. 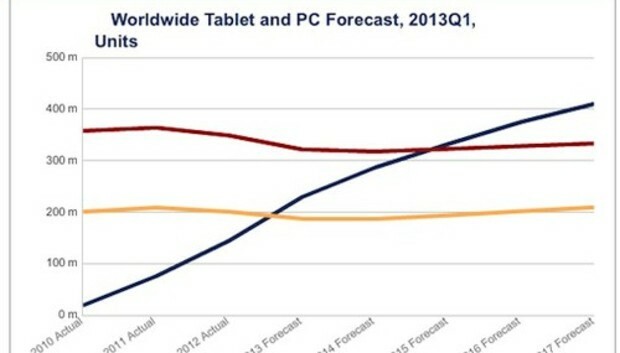 IDC expects tablets to outpace the entire PC market (both laptops and desktops) by 2015. IDC said in a statement that everyday computing involves accessing the Web, connecting to social media, sending emails and using app functions that favor tablets and that don't require the computing power or local storage available with a laptop or desktop. Users haven't given up on desktops and laptops for more intensive tasks, such as creating spreadsheets, IDC said, but those tasks are taking up less computing time on average and users rely on older PCs when doing so. "Tablets surpassing [laptops] in 2013 and total PCs in 2015 marks a significant change in consumer attitudes about compute devices and the applications and ecosystems that power them," said Ryan Reith, an IDC analyst. "PCs will [still] have an important role in this new era of computing, especially among business users. But for many consumers, a tablet is a simple and elegant solution for core use cases there were previously addressed by the PC." IDC says the worldwide average selling price for tablets is expected to drop by 10.8% in 2013 to $381. That's 60% of the average expected PC selling price in 2013 of $635. In coming years, tablet prices will decline even further, IDC said. Low cost Android tablets, some for as little as $100, are fueling the price reductions. Apple is likely to stay at the top in tablet quality and in higher pricing. Despite higher prices, company has still found success in selling iPads in the U.S. education market, Reith said. A new iPad mini now starts at $329, but some Android white-box tablets are selling by the millions to governments in India and Indonesia for education purposes, priced at just $100 apiece. "Compared to the iPad mini, a three times increase in price is a big difference," Reith said. "Even if a student got a new Android tablet once a year, that low price could be justified." IDC noted that the original 9.7-in. iPad was perceived as the sweet spot for tablets, but then 7-in. Android tablets began gaining traction in the market. Apple's response was a 7.9-in. iPad mini released late in 2012. In just two quarters, shipments of sub-8-in.-tablets soared and overtook larger tablets. For all of 2013, about 55% of tablets will be under 8 inches in size, while 43% will be 8 to 11 inches, and just 2% will be greater than 11 inches. In 2017, sub 8-in. tablets will comprise 57% of the market, while 8 in. to 11-in. tablets will take 37% and tablets of 11 inches or more will account for 6%, according to IDC. Tablets are generally thinner than laptops and usually much lighter. The average 7-in. tablet is .9 pounds, while the average 10-in. tablet is 1.4 pounds, according to Compreviews. By comparison, a sub-notebook with less than a 10.5-in. screen can weigh just under 3.5 pounds, and ultrabook laptops can weigh from two to four pounds. Ultrabooks are still a small share of the market,and many workers and consumers still carry older laptops that weigh from 4 to 6 pounds, Reith said. There are many reasons that tablet functionality is perceived as better than that on a laptop or desktop, especially for mobile users. Some analysts summarize all these features under "ease of use." One reason is the instant-on capability of a tablet, compared to one or more minutes for booting a laptop, analysts said. Battery life can also be substantially better with a tablet, with some Windows Surface RT tablet users getting 14 hours of battery life, compared with less than a full work day on most laptops, often only four to six hours. Touchscreen capability on a tablet is another change from older laptops and desktops. For workers who prefer a physical keyboard for writing longer emails and other tasks, many tablets support such a device, although often at an added cost. There are also Windows 8 laptops and desktops with touchscreens running on an X86 chip, which would seem to give the touchscreen an advantage over the more traditional PC form factors. But Reith said that's not been the case, as "there's been very little demand for this Windows 8 platform." The average consumer or BYOD worker with money to spend on consumer electronics will choose a device with a lower price and greater portability than a touchscreen laptop or PC. "The trend is really about mobile, and tablets are more mobile," he said. In work places, tablets are good enough for many work tasks, and have been "additive, rather than replacing PCs," Reith said. Having a tablet with a keyboard to use in a coffee shop is more mobile and convenient but also means there's less wear-and-tear on the PC desktop when it is used. "The corporate world isn't touching Windows 8," Reith said. Many corporate IT buyers are paying for Windows 8 licenses on new laptops or desktops and then rolling the new machines back to Windows 7. That phenomenon means that there is more room for workers to supplement their laptops or desktops with iOS and Android tablets. "The consumer-worker has a real voice in what's happening in the work force, and even C-level execs want to use their tablets on the network," Reith said. "Streaming music and video, email and Web browsing are all things I can do on a tablet, and it's just more comfy to sit on a couch and look at a tablet than a laptop." Despite lack of corporate interest in Windows 8 on desktops and laptops, IDC's updated tablet forecast increased for Windows 8 tablets running x86 to about 10 million shipped for all of 2013, an increase from an older forecast of 5.5 million. Windows RT tablets, however, were reduced downward in the new forecast for 2013, from about 4 million shipped to just over 3 million, Reith said. "We're seeing RT less and less," he said. In addition to price, function and size, tablets also allow easy access to cheap and fun apps that aren't always available on laptops or desktops, added Jack Gold, an analyst at J. Gold Associates. Gold said that while tablets might be on an ascending sales curve, there are still many functions where more work is needed. As such there will be a long life for big desktops, and IDC agreed. "You also have to have a list of things that tablets are not good at: Complex content creation, editing complex documents and spreadsheets, running databases and running off-line complex apps," Gold said. This article, 3 reasons why tablets thrive while PCs dive, was originally published at Computerworld.com.